Well, the game is definitely going for a more accessible tactical feel. The UI is pretty easy to get around and anyone with a working knowledge of titles like XCOM or Mario + Rabbids will feel right at home. The first few levels kinda ease you into the main gameplay mechanics as well as introduce the strange world of Mutant Year Zero: Road to Eden. The plot is pretty bleak for the most part, with a group of heavily mutated apocalypse survivors scavenging for resources in a strange world. You control a pair of Stalkers (can’t believe they didn’t get sued for that name) who must try and help the ‘Elder’ find a reclusive genius who can help the survivors. Mutant Year Zero: Road to Eden is definitely a fan of the ‘all hope is lost’ school of apocalyptic world building, and as such the survivors get by using more smarts than strength. Stealth is a big part of the game, and I would argue that stealth is some of the best we’ve seen in recent years. Getting around quietly is a big part of planning your next move, because getting the drop on your enemies nets you a huge advantage when starting an encounter. But of course, you’re a mutant, so you have an even bigger asset: your horrifying mutations. In the game, the buffs come in the form of mutations that allow your talking duck and pig buddies to – by some miracle – get even more mutated. This includes abilities like flight and super strength, and it’s very useful when trying to gain an advantage in the fight. Stealth is still really essential, and so, for the most part, you wanna try and get a good vantage point to take out enemies with as much strength as possible. A lot of the typical XCOM style rules also apply: focus on the high ground, line of sight, and anything that would logically give you an edge. I would say the game starts off strong but has trouble seeing it through. For starters, it’s a little bit on the short side, and I was in the final chapter inside of about 12 hours of gameplay. It’s not meager, but for a tactical action game, it’s shorter than it can be. Moreover, the game has a hard time balancing difficulty, especially in later missions. Now for fans of XCOM this may not be an issue, but for a casual like me, the final missions were especially frustrating. The enemies are usually ghouls, and by the end, you’ve seen more than a few different types. Some of the more aggressive ones can be especially frustrating to deal with, and you’ll definitely have your patience tested by the end. I will say that the game made a bold choice by giving us control of a fixed group of characters rather than an interchangeable group of grunts. The gameplay really comes into its own in the middle of the game when you get all your upgrades together, and you really feel like you’re investing in the character development. The story is a little predictable at first but there are some real twists near the end that I actually enjoyed. It’s a story that’s not afraid to be a little weird (I mean look at the characters) but despite the fact that you’re guiding a big talking pig, there’s a ton of humanity in Bormin and Dux. 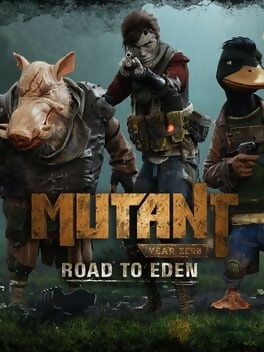 I felt like Mutant Year Zero: Road to Eden wasn’t perfect, but it did pretty much everything it set out to do as a game. The ending definitely feels like a good resolution, and it’s a worthy addition to the tactical action genre. Fans of XCOM style action might find it a little casual, but fans of Mario + Rabbids will definitely enjoy having another more accessible tactics game. Mutant Year Zero: Road to Eden was reviewed using an Xbox One downloadable code of the game provided by Funcom. The game is also available on PC and PlayStation 4 via digital and retail store releases. We don’t discuss review scores with publishers or developers prior to the review being published (click here for more information about our review policy).